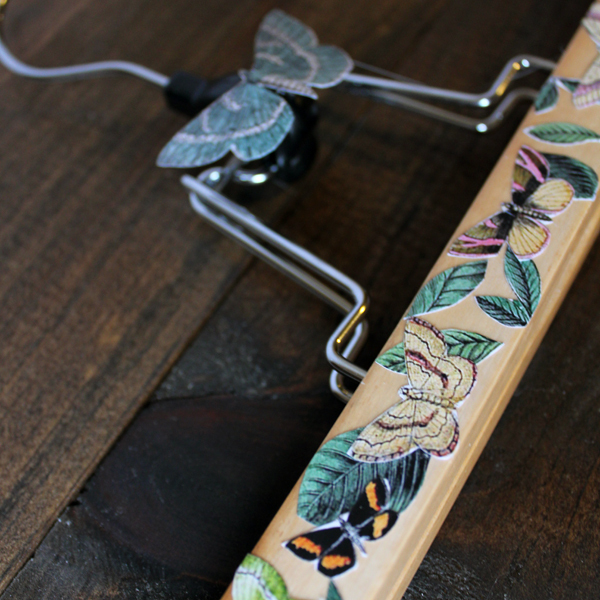 DIY Art Print Hanger – with Butterflies! Hi everyone, it’s Andrea from The Cottage Market. Hope you are all having a wonderful Holiday Season. The New Year is now less than a week away and I thought you would like a quick and easy DIY Project to start 2015 with a bang! I don’t know about you but I am always looking for some new wall art to mix things up a bit and The Graphics Fairy is sure a great place to find unique and gorgeous art prints. 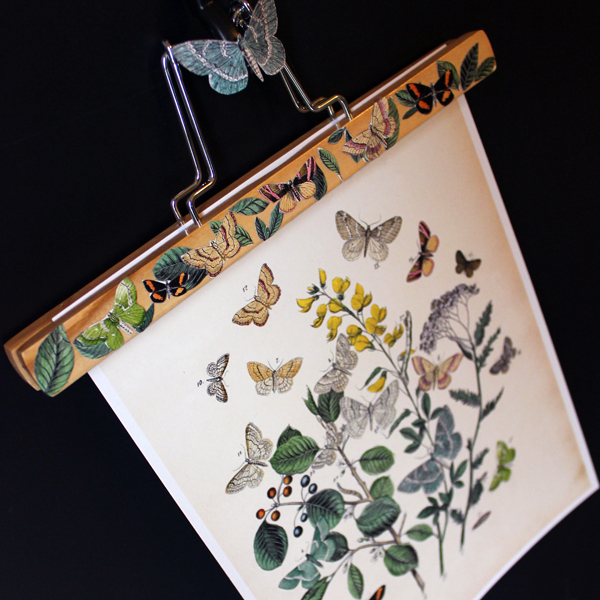 So why not create a hanger to compliment whatever art print or prints you choose. It’s so easy! 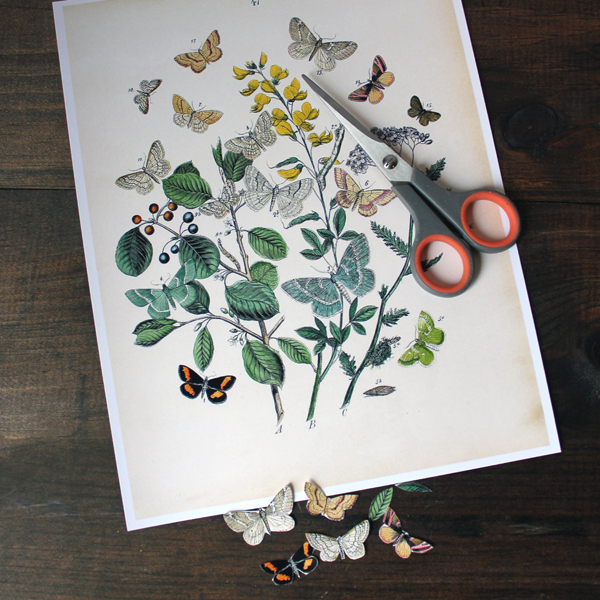 I found this Butterfly Print that I loved …made two copies of it…one being 25 percent smaller than the original and used that one to cut out focal elements to decorate a simply pant hanger. What I got in the end was a customized hanger that I can show off my print with. It is so easy to change things up…a simple click and you are on your way. 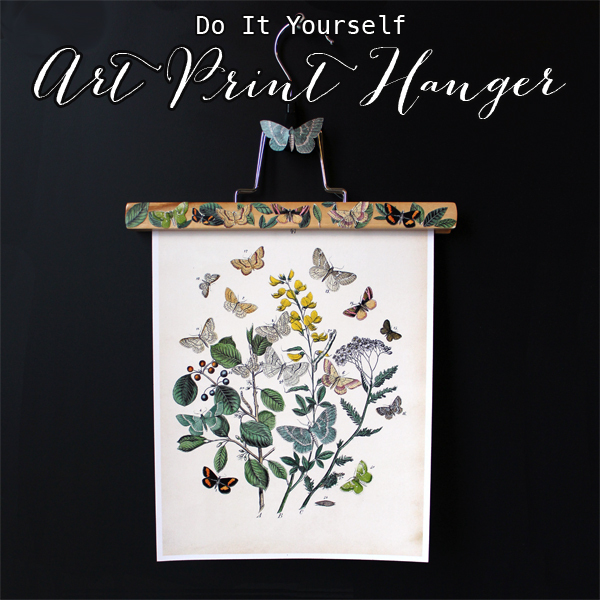 The sky is the limit with these…you can create hangers to compliment any art print at all. 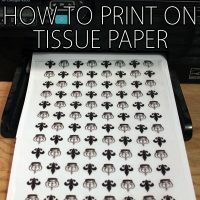 It’s fun and I sure hope you enjoy the basics and use it for the prints you love! 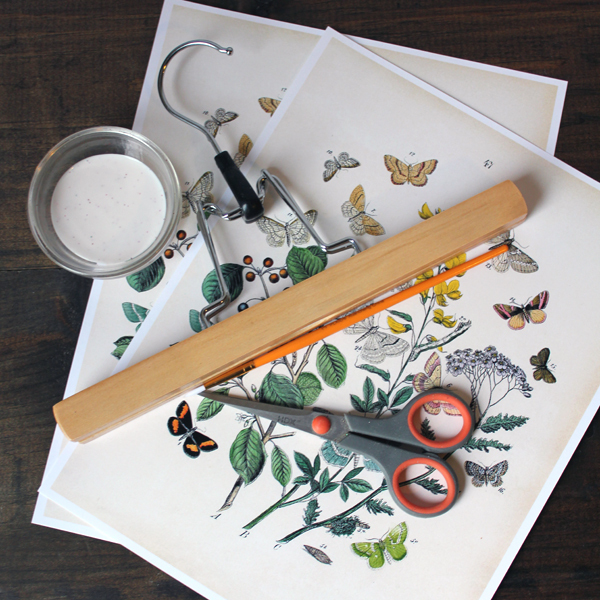 Time to make our DIY Art Print Hanger! 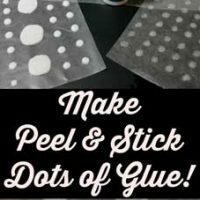 You only need a few supplies: Two prints…your favorite craft glue…I use Mod Podge, scissors and pant hangers. 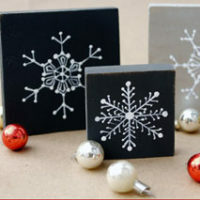 Now it is time to choose the accent focal elements and cut them out very carefully. Now all you have to do is apply a nice coat of your glue to the back of your focal elements and then place where you would like it. I put the leaves down first and then applied the butterflies on top of it and it worked out really nicely that way. You can layer with no problem. Continue to place your graphics to form your designs. 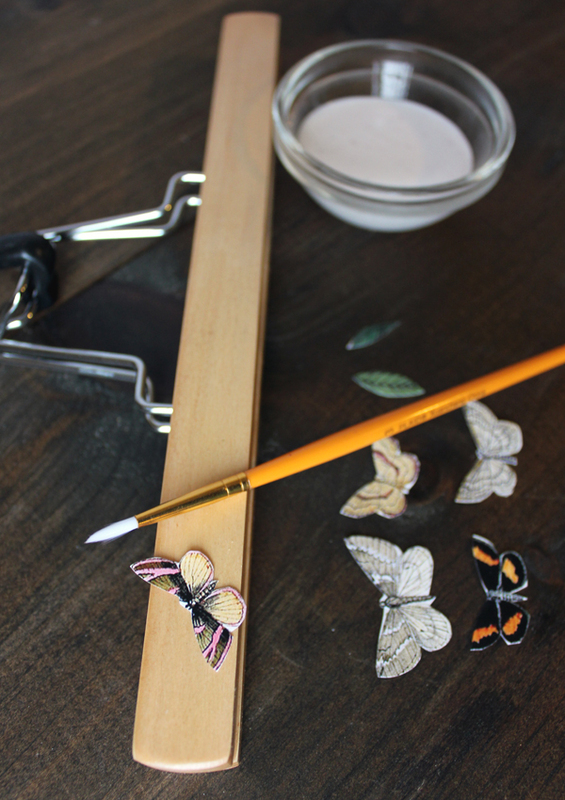 Press firmly on each image to make sure it adheres…then when everything is in place and dry…brush a clear coat of Mod Podge over the entire front of the hanger so it is protected. You are now ready to insert your favorite graphic print! I also added a graphic on the hanger just for a little bit more drama! Time to find the perfect spot to hang this! This method works incredible when you have grouping of four and of course more. Sure hope you enjoy! Hope you found this quick…easy and useful! : ) Here’s wishing you a very HAPPY and Joyous New Year and I will see you really soon! If you would like to drop by and visit…I am always hanging out at The Cottage Market! Looking for the perfect dessert that is quick…easy and amazing! 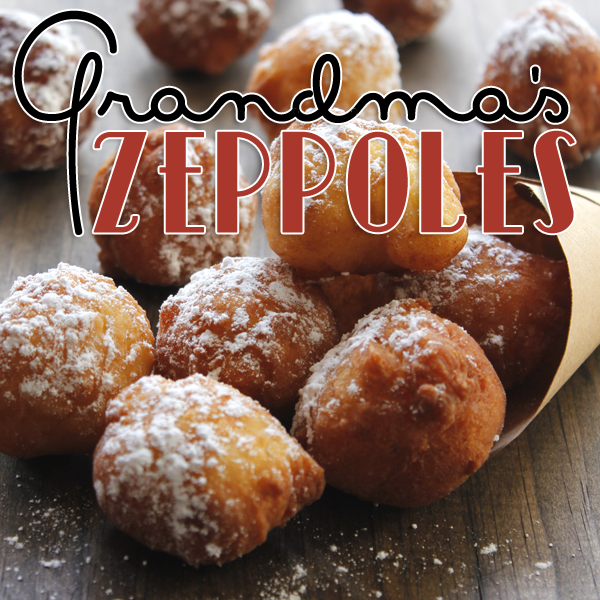 Try my Grandma’s Zeppole…you won’t be sorry! « Vintage French Roses Image!